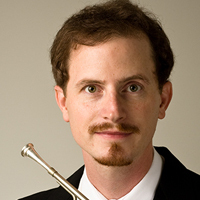 Hunter Sholar is fourth horn of the Nashville Symphony and second horn of The Santa Fe Opera Orchestra. He has also held positions with the Saint Louis Symphony, Florida Orchestra, Fort Wayne Philharmonic, Honolulu Symphony, Oregon Mozart Players, and the Colorado Music Festival. In addition, Hunter has performed with the Grand Teton Music Festival, Cincinnati Symphony, Chicago Chamber Musicians, Kansas City Symphony, North Carolina Symphony, Oregon Symphony, and Sarasota Orchestra. Hunter lives in Nashville with his wife Kristen and their two cats Frances and Manny. He is an avid disc golfer and home brewer and enjoys mountain biking, hiking, and backpacking.